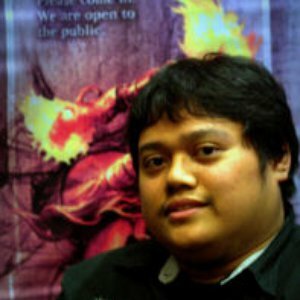 This week we feature Joel Bantiles, a level 3 from the Philippines and a one time Pro Tour player, who loves to draft and to play Hearthstone. One of his favourite Magic moments happened during his marriage. You want to know why? Just continue to read this edition of Judge of the Week and you will find out! 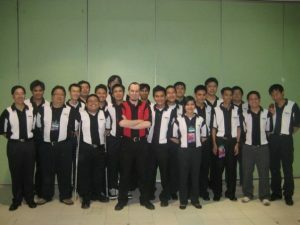 Judge start date: I became Level 1 during GP Manila in 2006, Level 2 during GP Manila 2008 and then Level 3 during Worlds Chiba 2010. Why did you become a Judge? The original answer to this question was that I wanted to be a good player and I thought being good with rules will get me there. In time, I improved my rules and policy knowledge but the playing part did not seem to follow. But it’s fine. I’m more than happy doing Draft Leagues in MTGO all day. Occupation: I’m currently a full time dad and my bosses are pretty tough. Favourite card: I have always been fascinated by Stasis. There’s a nothingness to it that appeals to me each time I played with it. Least favourite card: The card I’m not very fond of is Attunement from Urza’s Saga. It’s one of the cards that actually got me into learning more about the rules. Whenever it was in the battlefield I always wanted to destroy it, but I never could. 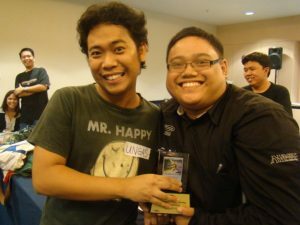 Commander General: Back when it was still legal, I won the very first Duel Commander Open in Manila with Derevi, Empyrial Tactician. That bird is nuts. Favourite non-Magic Game: These days I’m getting a bit of addicted to Hearthstone. Best tournament result: I qualified for my one and only Pro Tour with Pro Tour Return to Ravnica in which I got jetlagged, missed Day 2 by going 0-3 in the draft portion so I just slept all day in my hotel for Day 2. Random fact about yourself: One of the reasons I like to travel to judge during my younger years was that it gave me an opportunity to learn from other judges who were far, far more experienced than me. I would try to bring whatever I learned from them to the Philippines and teach it to the next generation of judges. It was its own reward and now we have a thriving Philippine Judge Community. This was Worlds in San Francisco. I was assigned to help with Sides and Sealed events are starting to get popular. One of the 8-man judge talks to the organizer informing him there was a shortage of lands. The TO comes up to us with a bunch of theme decks (I think now they are called Planeswalker Decks) and asks us to open up a whole lot of them to get basic lands. In my mind I was like, “okay…” that’s kinda weird. But it was so fun. I think we ended up opening like 50 or so theme decks just to get the basic lands. By the end the TO came up to us and said, “Isn’t this the craziest thing you’ve done all day?” and we were all like “For sure!”. Good times. I started with collecting NBA cards when I was about 12 but then grew out of it during high school. My classmates introduced me to this collectible card game that had a competitive side to it and the rest was Magic. Quite a lot actually. When I was still working for an IT Company I would always plan my leaves based on the schedules of the Grand Prix I wished to go to. When I got married all of my groomsmen were Magic players which was funny because I got married during the New Phyrexia Pre-release and all of them were asking if we could do a pod during the wedding reception. 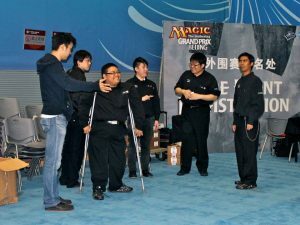 You were nominated for the inspiring way you overcome your handicap, particularly for what happened this year at GP Beijing. Can you tell us more about it? GP Beijing has always been a bit of a challenge for me in terms of my handicap. Since it’s inside a school there is no public transportation from the hotel to the venue which is I’m sure a short distance of walk to most. But to me it was sometimes a half hour breeze with multiple stops along the way. It was funny because I had forgotten how to go to the hotel which I have stayed in already twice before. So it took Reuben and me about an hour and a half walking around the campus trying to figure out where it was base on my foggy recollection of the place. Eventually we found it and everything went well. The event itself was wonderful. I was back in China which was always a fun trip. However I had a leg brace that started to malfunction and it was giving me a lot more trouble than it does normally. So one issue piled on top of another and it became a challenging couple of days. Luckily Reuben was there to help me and I’m very thankful not just to him but also to either judge and staff of GP Beijing for helping me soldier on during those challenging times. I still love figuring out rules questions, even the most obscure ones. So I think even if I’m retired from judging I would still be eagerly learning the rules and figuring out puzzles to solve. I like the people mostly, with whom I have known while judging. Especially those Grand Prix events were you see each other again after half a year but it feels like you’ve known each other all your life. Those moments keep me motivated to continue judging. I think the thing I always tell myself is that it’s a marathon, not a race. Do not burn yourself judging full time in which you lose interest on the things that made you want to become a judge in the first place or you become so jaded with those things that you do not agree with. It is after all still a hobby and it is correct when they say that if you are not having fun you’re probably doing it wrong. The best part for me is that it really feels like a family. Especially if you are part of a good LGS who knows how to take care of their players. It’s the best feeling. 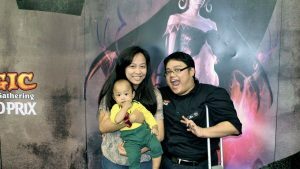 Many old players will leave the game, many new ones will replace them but it would still be a family even outside of Magic. You don’t get to have a fellow hobbyist, you get to have a friend. This days I mostly just play boardgames with my friends when I have the time. Everytime we meet up they end up teaching me a new game so it’s exciting for me. I’m trying to learn how to cook as the demands for a good home-cooked meal is pretty high when you have two growing kids that must constantly eat all the time. Definitely when me and my wife got married. The whole entourage on my side had been from one time or another been involved with Magic so it was fun. 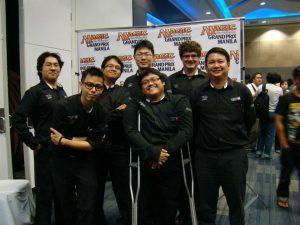 Even my principal sponsors were the distributors of the game and even joked that we could do a draft pod during the reception because of how many magic players were there. I don’t know if it’s actually rule-breaking but I remember holding on to a result slip going into the toilet. Apparently it ended up that I was the only missing table and I was holding the tournament up. So one of the lessons I always tell judges whenever I HJ is that you should always make sure you get the result slips from players before they go to the toilet. 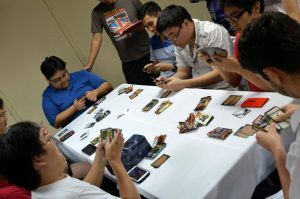 Pro Tour Honolulu (KTK) is definitely my favorite event. I always like talking to more experienced judges and that event I got to do that a lot. As part of the Deck Check team I was kind of in charge of translating the foreign cards as I think I was the only one who still played Standard so that was a bit of fun. 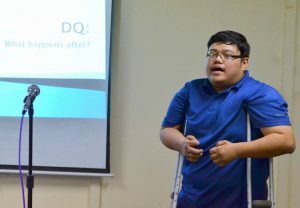 Also, I remember Jason Lems who was judge manager for that event at that time, taking me aside and talking to me about judging in general, getting feedbacks and other things as I believe this was the time of a great change in the program. It was a great learning opportunity for me. Besides it was Hawaii and you always have a wonderful time in Hawaii. There is a lot. But I think the most positive one is that it enhanced my ability to be confident in leading which I’ve used in my work, at home and just about everywhere else. Being able to lead correctly means being able to handle an obstacle, boost the morale of your group, accomplish the goal you all set out to do and enjoy the journey along the way. These are the things that I can say really helped me a lot. There is a quote from one of the judges that said something like “the Judge Program is an organization geared towards self-improvement that runs tournaments on the side.” I think it’s a very accurate description of the program. I would probably be running a food business with my wife which is what we actually plan to do soon. I can’t actually remember all the cards but it was a Commander game involving Eye of the Storm, Pyromancer’s Swath, Mind’s Desire and some other cards with Storm and we were trying to count how much damage would be done to all but one player who had Hexproof. 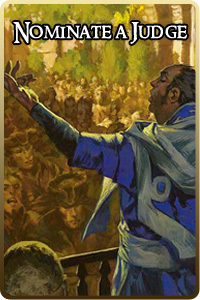 It was complicated and long which is typical of a good Commander game. 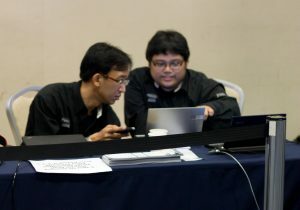 When I judge I’m usually serious with running our team’s task during the events which I know is a bit boring for some of my teammates so from time to time I try to do some team bonding with food or rotate leadership in my team so that for that round they can be the leader which I always get positive feedbacks from them. Not a lot, mostly just board games and Hearthstone. When the judge I promoted to Level 2 promoted someone to Level 1. That’s one of the proudest moments I have. It really was a defining moment in our community, at least for me. Always take care of your community. These are not just the players, stores or judges but also those who would like to join it or have been part of it. They are what makes the game of Magic great. I once missed a judged group photo because the photographer told me that the picture would be up the stairs so I went get food instead. The very first time I judged an event I was assigned to scorekeep and I kept entering the wrong results in DCI-R. I was asked to write an article about judging with a disability and the article was published in the Wizards website.